Do you make a home made craft beer and are you looking for a gift for all your groomsmen? This cobalt blue beer growler would make the perfect thank you gift. Engrave up to 3 lines of text in your choice of font. 1 liter Cobalt Blue Swing Top Lid Sand blasted Color filled in blue, red or gold While Supplies Last!!! 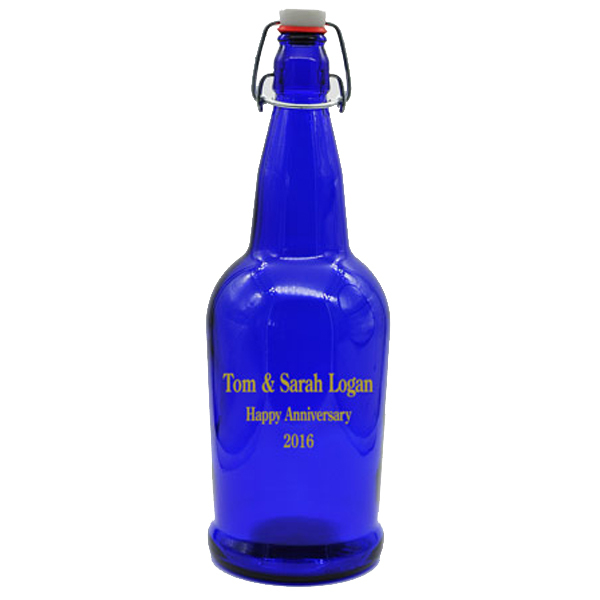 With its beautiful cobalt blue color, this beer growler will surely be the right choice for your hand crafted brew. Beer growler comes with a tight swing top lid to lock in the freshness. Up to 3 lines of text is sand blasted in your choice of 3 colors; red, white or gold. Don't hesitate, order yours today!